Thank you for your support, for the last five and half years! We are so happy that on July 19, 2018 LucasFilm has announced that Clone Wars will be back from another season! #CloneWarsSaved! 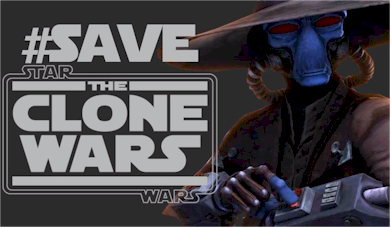 Also, thank you to the Clone Wars fans, for constantly reminding LucasFilm that we wanted them to #SaveTheCloneWars! On March 11, 2013, LucasFilm Animation announced the end of the Star Wars: The Clone Wars tv show on StarWars.com. Their announcement stated that " LucasFilm has decided to pursue a new direction in animated programming," that "we feel the time has come to wind down the series," and that "fans can soon find this bonus content." After hearing the news, and listening to Jimmy Mac and Jason Swank encouraging fans to write letters to Disney and LucasFilm on RebelForce Radio in the Episode, "RebelForce Radio: Special Report - Save The Clone Wars" released on March 11th. I decided on March 14, 2013 to start SaveTheCloneWars.com, and it's social media presence to try to encourage other Star Wars fans to reach out to Disney and LucasFilm. We appreciate Disney and LucasFilm and are looking forward to the sequel trilogy; however, we love The Clone Wars! We want more than bonus content (that were eventually released on Netflix as "The Lost Missions")! We want the many stories that the creators have set out to tell to be completed. We ask that the powers that be to please reconsider their decision and #SaveTheCloneWars. I vote keep the show rolling! The fan-base is huge and it's blatant that money can easily still be made off of this series. So many things are being left untold and it's f-ing ridiculous Disney would just cut it all short. Which pretty much just states "we have all the power, f you"... Pathetic. agreed after seeing how how season 5 ended it can't be left this way, it just can't the series, its creators and especially the fans deserve more than this. This will likely only be a back lash to the already tarnished name and rep of the star wars franchise that has come to pass with the prequels. When Star wars is mocked and adored alike its all in the name of flattery, what may come to pass here truly begs the real question..is nothing sacred? with Lucas passing on this monumental franchise to Disney has really ruined its magic and wonder I think and made the big business side of it all that's important. I just don't understand the time it's taken to at least make a comment or announce when it will be available. It's been noted that just about all of s. 6 was complete. I know they had to make changes to present it in some type of arc series, but you would think they would have gotten that done. Especially with Rebels coming up, you would think they would want to finish TCW and be devoted full time to Rebels. I'm just worried TCW might be getting ditched, or unfinished, with them saying some animation may be "un-finished" A little worried to say the least. Can it still be done? I just started watching, too! I want more episodes as well and hope there's still a chance. Star Wars and its characters are copyright LucasFilm & Disney. This is an independent website and not authorized by the LucasFilm or Disney. Page copyright ©2013-2018 SaveTheCloneWars.com, unless the material is noted as coming from someplace else or being by an individual author.